Last years winners did such a spectacular job that we're extending our 2020 calendar competition for the whole year! If you’d like to be in with a chance of seeing your own photography in our 2020 calendar, start taking photos now! We’re looking for high resolution amateur wildlife photography to cover every season. So, get snapping now and start sending us your photos! 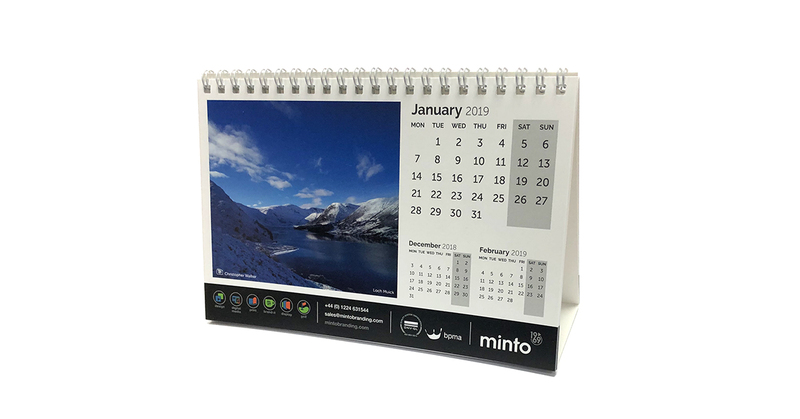 Choose your favourite high resolution pictures and email them to competitions@mintobranding.com with the subject line ‘Minto Calendar 2020’. Your entry should include the name of the photographer, where it was taken and what it contains. If you win your image will be featured on one month of our 2020 desk calendar and you will receive your own copy of the calendar. We will also be picking our favourite overall image to win £50 in Amazon Vouchers! Photos must be high resolution to be considered and will be cropped to fit the calendar. Please read the terms and conditions carefully. All entrants will be considered to have read and agreed to these terms and conditions. Good Luck! 1. The theme of the 2020 Minto Calendar is Wildlife. We’re looking for the best and most beautiful amateur wildlife photography to showcase every season. The competition will run throughout the year and we will be looking for entries that reflect the seasons as well as our wildlife. 3. The final aspect ratio will be almost 1:1 so, while images may be submitted in both landscape and portrait, they will be cropped to the centre of the submission. 4. Image enhancement is permitted but should not be used excessively. We will not accept superimposed or composite images. We reserve the right to exclude images that have been altered excessively. 6. This competition is open to amateur photographers. We consider any entrant who earns more than 50% of their annual income from photograph sales to be a professional photographer and not eligible to win. 7. The competition closes at 00:01 on Monday 21st October 2019. Entries received after this date will not be considered. We accept no responsibility for any problem with delivery of entries. Proof of sending is not proof of receipt. 8. All entries will be assessed on a technical level by the digital design team. Any images that do not meet the quality expected for printed images will be discarded. The best 200 photos (maximum) chosen on quality alone will go forward for judging. 9. Our lead judge will be our Design Studio Manager and he will short list these 200 and select worthy winners. Should there be more than 12 entries selected then the design team will be asked to rate their favourites. Finally the whole Minto team will vote on their favourite overall image. This will be counted as the overall winner. 10. In the event of a tie break the winner will be selected at random. 11. The prize will consist of a £50 amazon gift card with all selected receiving a selection of Minto goodies plus their printed calendar when we receive delivery. We reserve the right to limit or expand the selection of goodies for runners up in line with postage cost. 12. All entries must be the original work of the entrant and must not infringe the rights of any other party. The entrants must be the sole owner of copyright in all photographs entered and the photos must not feature identifiable persons. Entrants must not have breached any laws when taking their photographs. 13. All photographs must be originals. Entries that have been found to have been entered into other competitions or published in any other form will not be counted. 14. Entrants will retain copyright in the photographs that they submit but by entering the competition entrants grant Minto Branding LTD the right to publish their photographs in any format in perpetuity. Entrants, whose photographs are one of the final 12, also agree to take part in post – competition publicity. 15. While we make every effort to credit photographers, including in printed reproductions of their work, we cannot guarantee that every use of the photographs will include the photographers' names. Entrants must ensure that the photograph is not subsequently used to publicise or promote companies, individuals, organisations or causes. 16. By entering, entrants will be deemed to have agreed to be bound by these rules and we reserve the right to exclude any entry from the competition at any time. 17. We reserve the right to cancel this competition or alter any of the rules at any stage, if deemed necessary, and if circumstances arise outside of our control. 18. If the winner is unable to be contacted after reasonable attempts have been made, the prize will be offered to a runner up or repurposed in future competitions.